The Channel Checker is the affordable device that will let you know the status of your frequency at a glance. 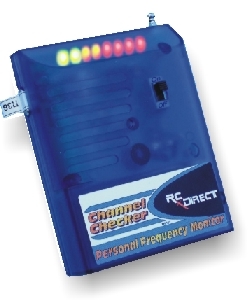 The RC-Direct Channel Checker personal channel monitor fits into your shirt pocket. The Channel Checker “scans” your channel and shows any adjacent 3 IM or other transmitter interference activity on its display screen. GREEN is all clear to RED do not fly. Some monitors only report if some one is on your channel if the signal is strong enough. The Channel Checker shows you the actual strength of any interference on your channel, giving you more information to decide in flying in your area.